The Lodi Dynasty or Lodhi (1451 – 1526 C.E. ), were rulers of Pashtun (Afghan) Ghilzai tribal origin and reigned during the last phase of the Delhi Sultanate. After the last Sayyid emperor, Mohammed-bin-Farid died in 1451, Bahlul Khan Lodi (died 1489), a warrior and governor of Punjab, came to the throne after other claimants abdicated. He stopped uprisings within provinces and garnered political support by giving Jaghirs (administrative territories) to his native Afghan nobles. His experiences as a governor before becoming emperor served him well, but his heirs were much less concerned than he was with good governance. They are described as becoming lazy and preoccupied with accumulation of wealth and with personal pleasure. Their own nobles invited Babur, the first Moghul emperor, to invade, which brought about the downfall of the Lodi dynasty. One contemporary observer, Guru Nanak saw this as divine punishment, and many people who believe that authority is both given and taken away by God would agree. God, said Nanak, is capable of reducing an army to ashes, and appointing someone insignificant to kingship. Bahlul nominated his second son, Sikandar Lodi (born Nizam Khan and died 1517) to succeed him. However, nobles backed the rule of Barbak Shah, his first son that had been appointed viceroy of Jaunpur. A power struggle ensued, and Sikandar eventually won the struggle against Barbak and his ally, Hussain Shah of Jaunpur. He proved to be a capable ruler, and was somewhat merciful to his opponents. He allowed Barbak governorship over Jaunpur, and also resolved differences with an uncle, Alam Khan, who had conspired to overthrow him. Sikandar also brought many Afghan nobles under his control, conquered Gwalior and Bihar, and encouraged trade across his holdings. He patronized education. He founded the present-day city of Agra in 1503, later renowned as the site of the Taj Mahal. Muslims and Hindus differ in their appraisal of Sikandar. Muslims usually regard his rule as just but Hindus point to his destruction of Hindu temples, including those at Mathura, Utgir, and Jwalamukhi at Nagarkot, and of building mosques in their place as an example of his tyranny. This practice would be continued by Babur, the first Moghul Emperor. It is claimed that idols (images) from destroyed temples were given to a butcher to use as weights. Hindus were prohibited from shaving their heads and beards, in accordance with Hindu customs. Sikandar's son, Ibrahim Lodi (died 1526), took the throne in 1517. His rule was problematic from the start, as nobles named his brother, Jalal Khan, ruler over Jaunpur in an attempt to divide his kingdom. Ibrahim had his brother assassinated in an attempt to consolidate power. Guru Nanak (1465 – 1539) recorded that the brothers were rivals for power and riches, and lost any real concern for good governance; Ibrahim never really gained the support of his subjects. He used fear against his peoples and even his nobles. Ibrahim tried to make his presence felt by retaking Gwalior in a military campaign, but Ibrahim's luck ran out against Rana Sangha, the ruler of Mewar, who defeated his armies twice and drove him back. The Afghan nobles grew discontent with Ibrahim's rule and cruelty, and sent for the armies of Babur, the ruler of Kabul, to overthrow the Lodi dynasty. Ibrahim's rule has been described as tyrannical. Babur was officially invited to take India by Daulat Khan Lodi, a governor in Lahore, and Alam Khan, an uncle of Sultan Ibrahim. With this invitation, Babur brought his armies and was able to topple the Lodi rule at the Battle of Panipat in 1526. On the other hand, despite their own internal problems the Lodis managed to field an army of 100,000 men and 1,000 elephants against Babur's paltry force of 12,000. Despite the odds, Babur routed the Lodi Sultan and took possession of Delhi. His army's use of artillery, plus the desertion of many nobles and soldiers from Ibrahim Lodi's forces, led to victory despite being heavily outnumbered. Indian rule was to change under Babur, the first ruler of the Moghul Empire in India. Nanak reprimands the Lodis for resorting to magic to try to defeat Babur and for failing to adequately protect their realm. "Thousands of Pirs tried to stop Mir Babur (by means of magic) when they heard of his invasion. But no mughal was blinded and none of the spells had any effect," he wrote . 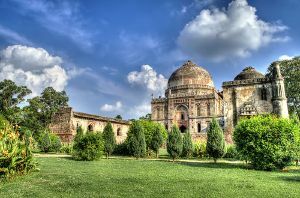 An important aspect of the legacy of the Lodi dynasty is their architectural contribution in Delhi, where four Lodi buildings can be seen in what are now the Lodi Gardens, Mohammed Shah's Tomb, Sikander Lodi's Tomb, Sheesh Gumbad, and Bara Gumbad. The tomb of Mohammed Shah, the last of the Sayyid rulers ((ruled Delhi 1414 – 1451), is the earliest of these and was built in 1444 by Ala-ud-din Alam Shah to pay a tribute to Mohammed Shah. Guru Nanak tells us that the Lodis were defeated because they grew intoxicated with power and “sensual beauty”: the wealth and sensual beauty had intoxicated them, and they have lost their sense in merry-making . Nanak believed that unrighteousness could not last long and that thus the Lodi's defeat was inevitable. He blames the Lodis for the later atrocities of the Moghuls, since had they succeeded in protecting their empire, Babur would not have established the Moghul Empire. History of "Afghan Lodi Sultans"
This page was last modified on 5 February 2019, at 00:47.